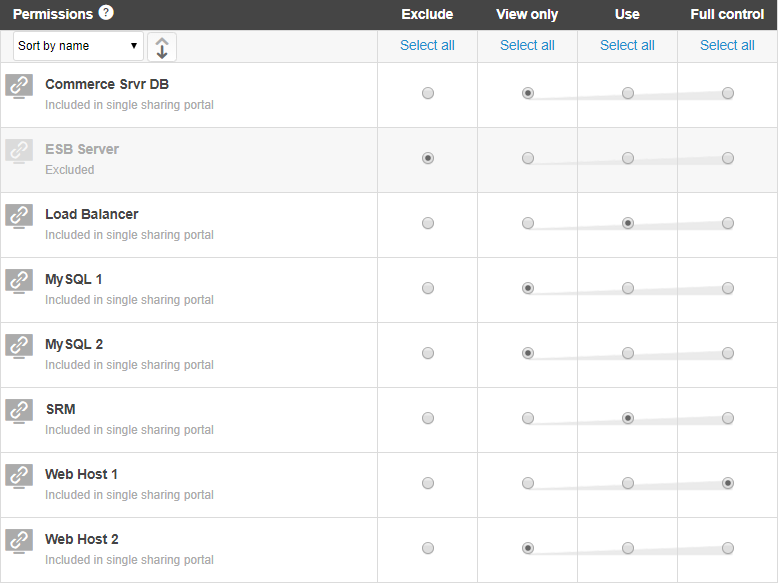 The Sharing Portal Options page lets you customize, preview, and send a sharing portal. From the navigation bar, click Environments. Click the Environments tab. This displays a list of environments you have access to. (Optional) Use the filter, search, or sort options to find the environment you want to use. Click the name of the environment. The Environment details page displays. Click the Sharing Portals tab. A list of sharing portals is displayed. Click the name of an existing sharing portal to edit the options, or click (Add Sharing Portal) to create a new sharing portal you can further customize. Change the sharing portal type, visit the sharing portal, or make the sharing portal available to other people. Edit – Change the sharing portal type. Choose Single sharing portal or Sharing portal set. Visit Portal – Test the sharing portal in a new browser tab. Copy URL – Copy the URL for the sharing portal to share it in a web page or other medium. Mail – Loads a default email message you can send to the people who will use the sharing portal. The email message contains a link to the sharing portal and links to troubleshooting resources. If you chose a sharing portal set, the Copy URL, Visit Portal, and Mail options are available for each VM in the set. 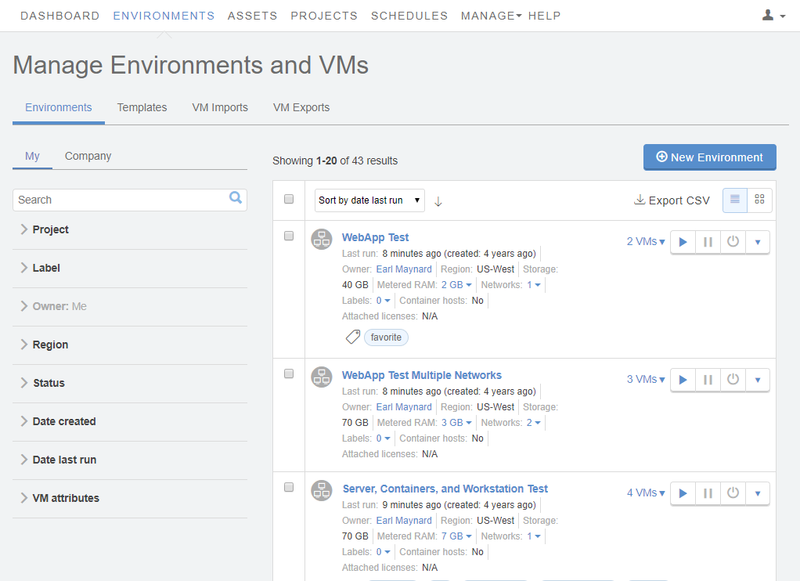 Select the level of control users have over VMs in the environment. Users can’t see this VM. This VM is visible, but users can’t interact with it. Users can interact with this VM, but can’t start or stop it. Users have full control over this VM. They can run, suspend, shut down, reset, and power off the VM. You can choose permission levels for each VM or click Select all to set all VMs to a single permission level. 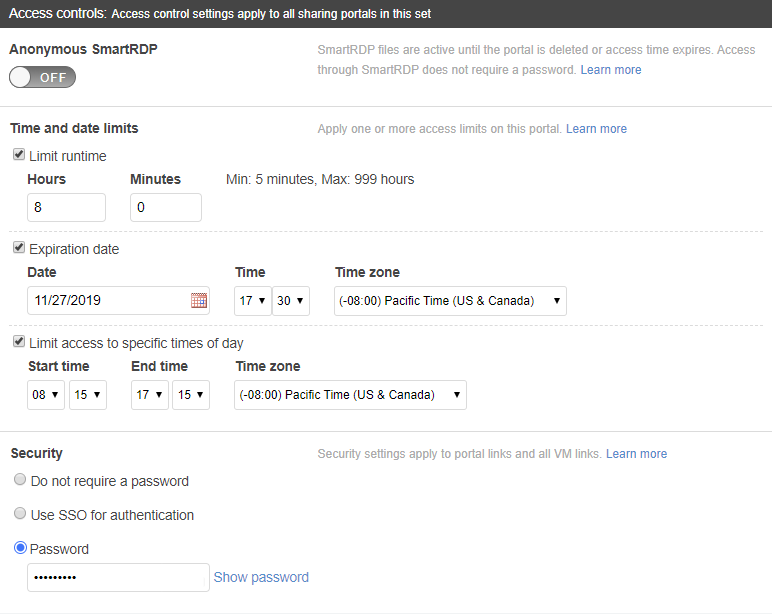 You can provide direct connection to a VM with SmartRDP access, set time and date limits for the sharing portal, or limit access with a password. Time and date limit information displays in the sharing portal view. When this option is enabled, users can download a SmartRDP file for each shared VM. The SmartRDP file lets the user connect to the VM using RDP. This provides an alternate option for accessing the VM desktop. Disabling SmartRDP removes the user’s ability to download the SmartRDP file. 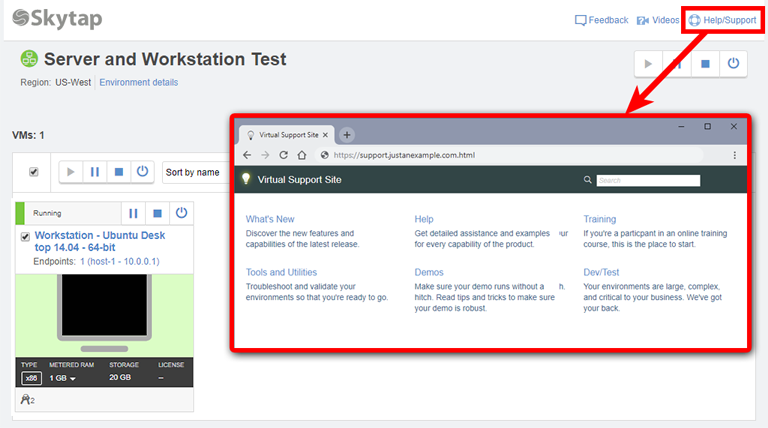 If SmartRDP is enabled and then later disabled, users can continue to connect to the VM with any SmartRDP files they previously downloaded. 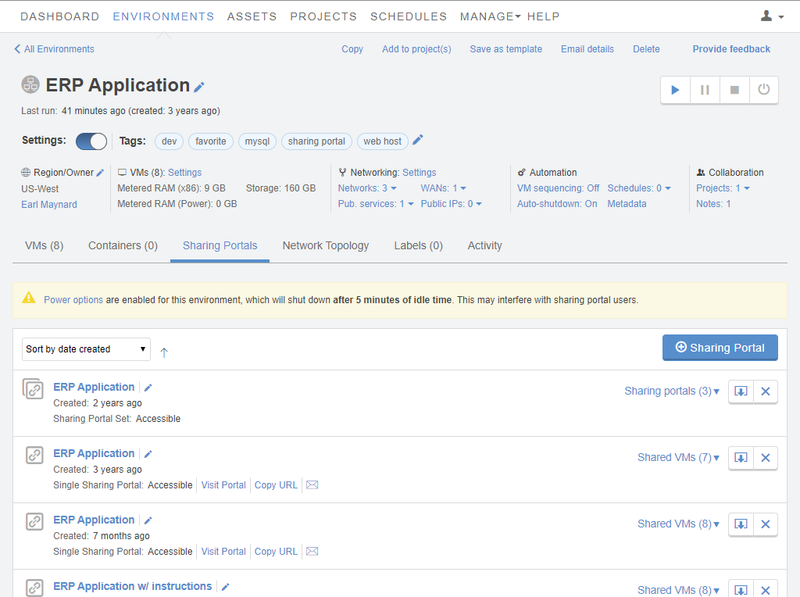 To permanently disable the ability to connect to the VM with SmartRDP, delete the sharing portal. SmartRDP access does not require a password. You can allow access to a sharing portal on a schedule. 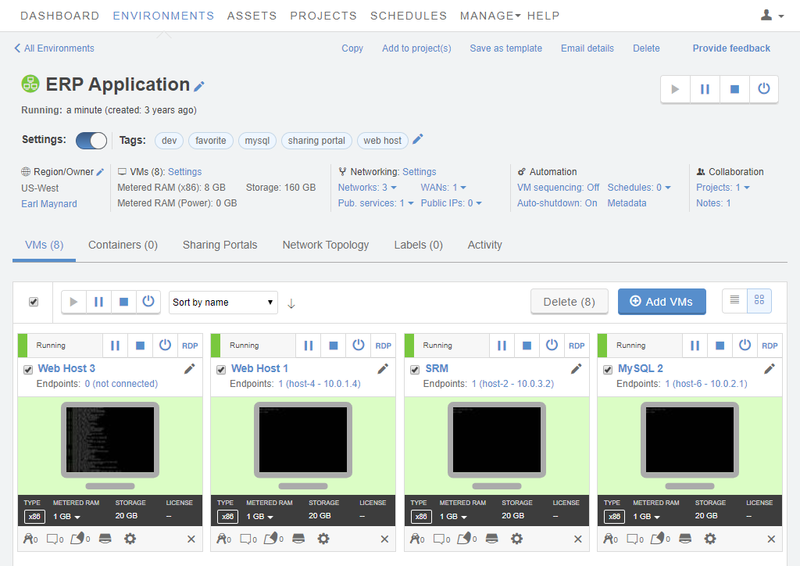 Limit the total duration of time that a user can run and access VMs in the environment. When the runtime limit is reached, the VMs can no longer be accessed. The sharing portal is not deleted, and the VMs are not automatically suspended. The environment owner can add more time to the runtime limit to reinstate access. The timer runs only when someone is accessing the sharing portal and the VM or environment is running. The timer stops when all VMs in the sharing portal are powered off or suspended. The timer does not reset if the runtime limit is extended. For example, if someone uses four hours of a VM with a runtime limit of five hours, extending the runtime limit to six hours lets the user continue for only two more hours. VMs are not automatically suspended when the sharing portal runtime limit is reached. To set a timer that will automatically suspend the environment when it is no longer in use, see Automatically suspend inactive environments. To automatically suspend the environment at a specific date and time, see Automating actions with schedules. Access to the environment expires at the specified date and time. The sharing portal is still present but access to it is prevented. You can allow access to it by changing the expiration date. Access to the sharing portal is limited to the specified time of day. Anyone can use the sharing portal URL to access the environment and interact with it according to the permissions. This option appears if your account is enabled for Single Sign-On (SSO). If this option is selected, users must be authenticated by your Identity Provider (IdP) to access the environment from this URL. Any user who has the sharing portal URL and successfully authenticates via SSO can access to the sharing portal; the URL is not tied to a single user account. Users must enter the password to access the environment from this URL. These options control the behavior of the Help/Support button in the sharing portal. The Help/Support button links to a Skytap help article. The Help/Support button links to your support desk email or a custom help site. You can link any website or email address to this button. A custom support link must start with either http://, https://, or mailto:. This option allows you to include a second tab in the sharing portal. This tab can contain HTML content, including instructions, examples, download links, and links to other pages.